…and one of them isn’t the Liberal Democrats. That adds up to 72. The 73rd MEP, Godfrey Bloom, has been sitting as an independent since he resigned his party whip in September 2013. 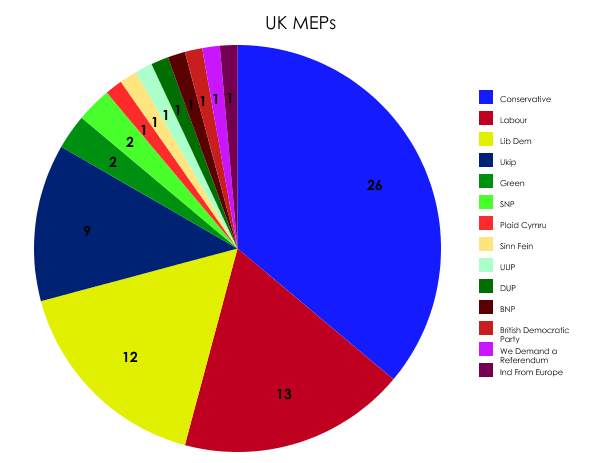 Of those 14 parties, I reckon there’s a chance of four disappearing from the European parliament after this month’s elections – and possibly a fifth. First, we should be able to say goodbye to the far-right. Both the BNP and its breakaway group, the British Democratic Party, will almost certainly be wiped out at the polls. The BNP candidate is the party leader Nick Griffin. At the last elections in 2009 he became an MEP for the North West region after the BNP won 8% of the vote, coming fifth behind the Tories, Labour, Ukip and the Lib Dems. I can’t see this being repeated this year. The eight seats up for grabs in this region should fall to the same top four (probably 3:2:2:1, with Labour just coming first). The British Democratic Party is represented by ex-BNP member Andrew Brons. He’s already announced he’s standing down this time, but even if he were contesting his seat in the Yorkshire and Humber region, the 9.8% vote share his party won in 2009 would disperse – like Griffin’s – elsewhere, I suspect mostly to Ukip and Labour. The region gets six MEPs, and there’s a chance the Tories, Labour and Ukip will end up with two each. The other two parties almost certain to disappear this year are the two Ukip splinter groups: the We Demand a Referendum Party and An Independence from Europe. The former was set up by Nikki Sinclaire when she fell out with Nigel Farage. Sinclaire is standing again for a seat in the West Midlands region. I can’t see her winning. The same goes for Mike Nattrass of An Independence from Europe, who also won in 2009 in the West Midlands. Both should revert to Ukip, probably leaving this region with two Tories, two Labour, two Ukip and one Lib Dem. And the fifth party to get wiped out? I wonder – and worry – about the chances of survival in the Wales region for Jill Evans of Plaid Cymru. Wonder because the latest poll suggests she may lose to Labour. And worry, because it would be a shame were the nationalist voice in Wales to have zero representation in the European parliament. But that’s just me being sentimental. As for the overall “winner” of the EU elections, I’ve no idea whether Labour or Ukip will top the share of the vote. What ought to matter more is who ends up with the most seats. Even if Ukip does emerge with the most votes, the delights (or drawbacks, depending on your view) of the D’Hondt method of PR may still leave them with fewer seats than Labour. I’ll return to this conundrum before polling day! By way of a footnote, the one and only independent will also disappear. Godfrey Bloom is retiring. I’d imagine his seat for the Yorkshire and Humber region will move back into the Ukip column come polling day. What do you think the European elections will mean for the Green Party ? They’ll definitely hold on to their existing two seats and get at least one more, probably at the expense of the Lib Dems. I’m not sure they’ll reach their target of five seats. But whatever happens, the Greens will be one of the few parties who’ll be able to say they’ve had a “good” European election!